Senders Floating Levitating Globe, Makes an absolutely beautiful desk accessory. You will have people stopping and checking it out almost every time the pass by your desk. An electromagnetic field suspends the world globe in mid-air while it slowly rotates. 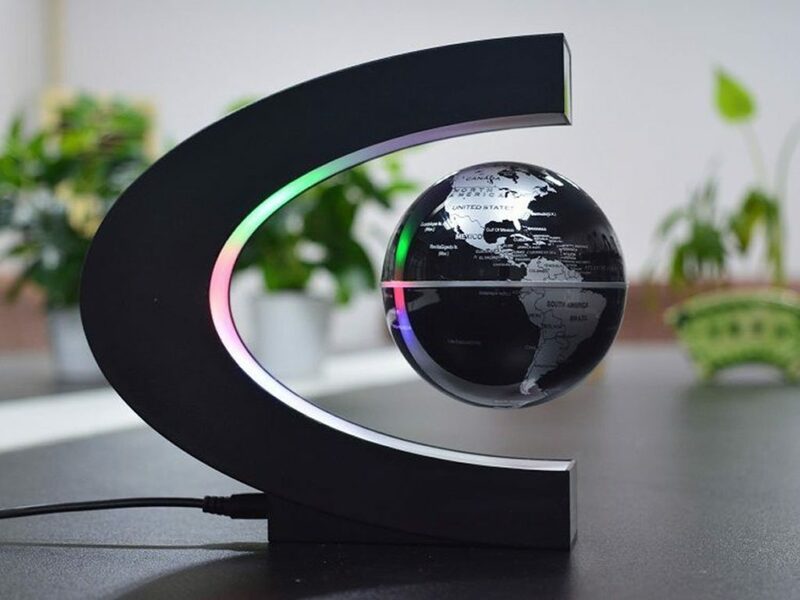 The floating levitating globe is very well priced, you can get yours by clicking the button below. Bottom Line, This is a novelty gadget that people display on their desks at home or in their office. People cannot resist touching the floating globe! Bottom line up front: I have this displayed in my office and while in the end in does not really do anything, it does catch a lot of people’s eye and a lot of them are tempted to touch it. This would be considered a novelty item but still a neat piece that would easily strike up a conversation with anyone that saw it. I had seen these floating globes before and always thought that they were neat to look at. What was different about this one that I did not see before was the LED lights in the background. I saw this and decided to give it a try. The following are my thoughts regarding this product. This is the first time that I seen something like this that had the LED lights. This may be a common feature now but before it was not. As if the floating globe was not enough, the LED lights are sure to attract extra attention. Although getting the globe to float did take some practice, after a while, setting it up is easy to do. In the video, I show how the instructions stated to get the globe to float. Once you get the hang of how much distance you actually need, I no longer need to use the finger method and am able to float the globe without using the finger. The last thing you need is an item that is more of a novelty piece taking up a ton of space. The nice thing about this product is that its slim design really allows is to just float in the corner of an office or desk.